Wondering what something means and how it contributes to your drum sound? All of the terms used on this website, and more generally in the drumming world, are covered here. See below for the different variables related to your drums, drumheads, and drum sound – learn how to control everything to get the most out of your kit. The first thing you hear when you strike a drumhead. For drumheads, the attack is the early crack, punch, or sharp thud that is heard first when the drum is hit. More attack means your drum will be more easily noticed, even in loud environments. Thicker, clear drumheads will usually have a louder attack, although the attack can drop off if the drumhead is too thick or has too much dampening. The top drumhead - this is what you hit. The batter drumhead gives the initial attack (the punch). Depending on its thickness, ply, and dampening, it also contributes to the sustain, overtones, and general sound of the drum. The angled top and bottom edge of the shell, where the drumhead sits. Bearing edges are cut on an angle around the top and bottom of the drum shell. A sharper angle gives a brighter and more resonant sound. A damaged bearing edge will mean the drumhead cannot make a complete seal around the drum shell. This makes tuning difficult or impossible, and will greatly affect the sound. Check bearing edges when buying used drum sets. The ratio of frequencies (high / mid / low) produced by the drumhead. Brighter = more high frequency tones. Thinner or 1-ply drumheads with little or no dampening allow for a brighter drum sound. Tuning your drumhead higher will also bring out the brightness. Balanced = an even mixture of high, mid, and low frequencies. Warmer = more mid and low frequency (deep sounding) tones. Thicker drumheads, 2-ply drumheads, or heads with more dampening will create a warmer drum sound. Tuning your drumhead lower will also increase the warmth. Clear drumheads are slightly brighter, slightly more attacking, and have slightly more sustain and overtones compared to coated drumheads. They're also slightly less responsive, and are not recommended for using with brushes. A coating applied to the drumhead. The coating changes the drum sound: coated drumheads are slightly warmer, slightly more responsive, slightly less attacking, and have slightly less sustain and overtones compared to clear drumheads. Note that this difference is quite small when comparing clear and coated versions of the same drumhead type. The coating also provides a rough surface which is perfect for playing with brushes. Different types of drumhead coatings include white, semi-translucent, frosted, or black. The amount of sustain and overtones. More controlled = shorter sustain and less overtones, with more focus on the fundamental note. A very controlled drumhead is one that doesn't ring out. Inlay rings (e.g. Evans HD), control rings (e.g. Remo Pinstripe), thicker or 2-ply drumheads, and accessories like o-rings or moongels are used to control the sound of your drum set. Rings printed or attached to the drumhead. Control rings come in a variety of forms, ranging from thin rings to very thick material. A form of dampening, control rings can reduce overtones, control sustain, and give the drumhead slightly more attack. Control rings also focus the drum sound more on the fundamental note; this is because they are found around the edge of the drumhead where more overtones are produced. Put simply, control rings control the ringing. Control rings often look like black rings printed onto the drumhead, and they sometimes have a material underneath them (or between the drumhead plies) for a greater effect. An example here is the Remo Pinstripe, which has a ring printed towards the edge of the drumhead. Outside this ring, the two plies are stuck together with Remo's "overtone reducing agent". Inside the ring, the plies can float freely. This gives a punchier and more focused sound, with less overtones. 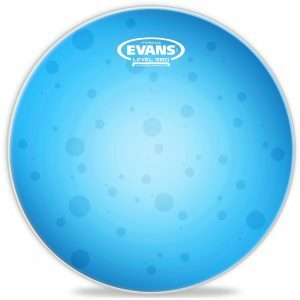 The Evans EMAD comes with removable control rings, allowing you to choose the amount of dampening depending on your situation. Control rings can also come in the form of a thicker ring stuck to the drumhead. The Aquarian Super-Kick is an example of this: the Super-Kick has a muffle ring attached the the underside of the head, which cuts overtones and gives a very focused sustain. Applying something to the drumhead to reduce sustain & overtones, or fatten the drum sound. Some drumheads have built-in dampening (e.g. control rings, inlay rings, center dots), or you can add dampening yourself. Moongels, o-rings, tape, towels, your wallet - all of these things reduce sustain and overtones, and can make the drum sound warmer and fatter. One thing with dampening on your drum set - don't overdo it! Too much dampening will severely reduce your volume and projection. 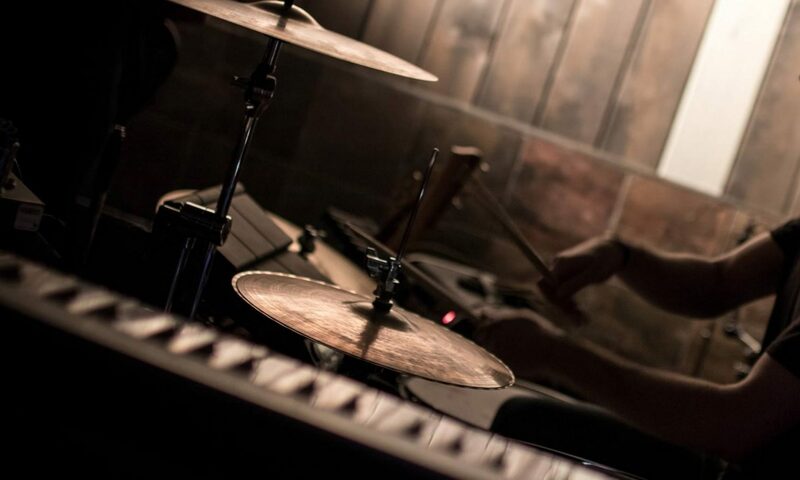 Always use dampening to complement your sound, not to cover up your bad drum tuning. If you're wondering whether you're adding too much, go with less. Also remember your drum set will sound different from the audience's perspective - the ringing you're trying to remove with dampening might already be unnoticeable. Used to tighten the tuning rods, pedals, memory locks, everything. You use a drum key to tune your drumheads, or to install or remove them. You can never have enough of these. Drumheads were originally made with animal hide (animal skin), hence the name "skins" when talking about drumheads. Since the 1950s, Mylar has become a much more common drumhead material, although animal hide drumheads are still available. How much the drumhead will stand up against long-term use and heavy hitting. Thicker and 2-ply drumheads will last longer. Some drumheads also have a centre dot which can protect against damage (while also controlling overtones). For bass drums, there are also patches to increase durability. 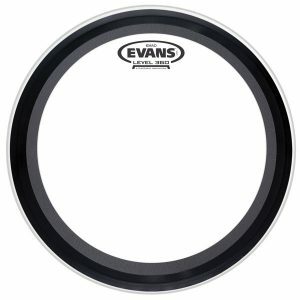 The Evans Hybrid is an example of an extremely durable drumhead. If you play loud and hard, you'll want a more durable drumhead. If you're not a heavy hitter, don't be put off by thinner "low" durability drumheads - the word low is relative here, and these drumheads are still very good quality and will hold their shape. The way you set up your drum kit will affect the longevity of your drumheads. One of the mistakes new drummers often make is tilting the toms too much, which will cause pits in the drumheads when you hit them. Keep the toms relatively flat on your drum set; this will help you build good drumming technique and will help your drumheads last longer. Tuning the drums too low or extremely high will also reduce the durability of your drumhead - this is perfectly fine if it's the sound you want, just make sure you're tuning this way for the right reasons. A texture scratched into the drumhead's surface. Etched drumheads, like the Evans J1 Etched, have the texture etched (or "scratched") into the surface rather than applied like a coating. The upside here is that the surface won't chip away like some regular coatings can. Remo's Suede drumheads have their textured surface applied in a similar way. Etched surfaces are usually very brush-friendly, making them a good choice if you play with brushes. A cleaner sound, with less overtones. If you've read a few descriptions of drumheads on this site, you've probably seen the word "focused" used a lot. "Focus" means more emphasis on the fundamental note, rather than on ringing overtones. "Focused" can also be thought of as similar to how the word "controlled" is used to describe a drumhead's sound. Things like control rings help to focus the sound, cutting out strange ringing and leaving you with an overall cleaner tone. An example here is the Aquarian Super-Kick 10, which is a very focused bass drum head. The word "focus" can also be used in a more general sense. For example: The Aquarian Modern Vintage's synthetic fiber coating means the sound is much more focused on the warmer tones, rather than on the high-pitch frequencies. Frosted drumheads have a coating applied to them, just like regular coated heads. The difference is that the coating is lighter in weight, and is semi-transparent. Because the coating is not as heavy, there is less of an impact on the sound when compared to a regular coating. These drumheads will usually be slightly brighter and slightly more open sounding than a regular coated drumhead, but are still great with brushes due to the textured surface. The primary note a drum is tuned to. This is the main note you hear when hitting a drumhead, which changes with tuning. This is the lowest and loudest note you hear when you hit the drum. You'll also hear overtones - various notes that are lower in volume and higher in pitch than the fundamental note. These combine to give the overall tone of the drum. For more of the fundamental note and less overtones, make sure each lug is tuned to the same pitch (check the pitch of the drumhead an inch or two from each lug). The drum shell itself also has a fundamental note where it resonates the most - this will be different depending on the size, ply, and material of the shell. A drum will be most resonant when tuned to its fundamental note. A quick way to discover the drum's fundamental note is to hit the side of the drum to hear the pitch of the shell. Hazy drumheads are made with a different type of film than clear heads. The film used is semi-transparent, hence the "hazy" name. Hazy drumheads are usually slightly warmer sounding compared to clear drumheads. Note that this is not a coating, and the overall look and feel of a Hazy drumhead is very similar to a clear head. The metal or wooden ring that holds down the drumhead. Drum hoops are usually made of metal or wood. Heavier hoops will usually provide more volume and reduce overtones. See this page for more information on drum set hoops. Like an o-ring, but built into the drumhead. A form of dampening. Inlay rings help reduce unwanted overtones, control the sustain, and add a slightly fatter sound. Compared to o-rings, inlay rings have less of an impact on your drum sound. Inlay rings are usually not removable, and are usually on the underside of the head (although some bass drumheads can have removable inlay rings, sometimes on the outside for easier access). Click here to view and compare drumheads with inlay rings. Attached to the drum shell, rods are screwed into these. Lugs can affect your drum sound: Heavier and larger lugs on the drum shell will reduce the shell's resonance. Free-floating drums are made without lugs to allow the shell to resonate fully. "Lug" and "Rod" are often used interchangeably when talking about tuning a drum. For silent practising that doesn't annoy the neighbours. These drumheads are made of a thin mesh designed to give a similar feel to real drumheads, but with almost no sound. You can put these on your drum set like any other drumhead, and can tighten them to increase the responsiveness. A lot more fun than a rubber practice drum pad! Some electronic drums also use mesh drumheads to give a more natural feel compared to standard electronic rubber drum pads. 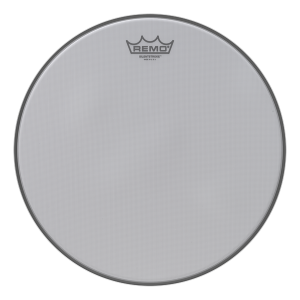 The Remo Silentstroke is a popular mesh drumhead. 1mil = one-thousandth of an inch. Used to measure the thickness of the drumhead. A smaller number here means a thinner head. Note: this is different to a millimetre (mm) which is one-thousandth of a metre. The most common drumhead material. Most clear and coated drumheads are made with a material called Mylar. This drumhead material is a type of plastic, and has been used since the late 1950s. Before this time, the most common drumhead material was animal hide. A lot of today's synthetic fiber drumheads are also made with a Mylar base, plus a synthetic material coating the drumhead (giving the look and sound of animal hide). A thin, removable ring of plastic that sits on top of the drumhead. A form of dampening. These are used to control sustain and overtones, fatten the sound, and give the drums more warmth. Sometimes these have tambourine jingles added. Depending on the size and thickness, they can have a dramatic effect on the drum's sound. The different frequencies heard when a drum rings out. Overtones are the various different notes you hear when hitting a drum. These can be very musical, or absolutely awful depending on tuning... If each lug is tuned differently, there will be a huge range of different overtones. The sustain of a drum is made up of overtones plus the fundamental note. Thicker drumheads, lower tuning, and dampening (e.g. o-rings, center dots, moongel, control rings, tape) will reduce overtones. The number of layers making up your drumhead. 1-ply (single ply) = one layer making up the drumhead. This allows for more sensitivity, brightness, resonance, sustain, and overtones. Resonant drumheads are most commonly 1-ply. 2-ply (double ply) = two layers making up the drumhead. These drumheads have a warmer sound with less resonance, sustain, and sensitivity compared to a single ply head of the same thickness. An oily rainbow can sometimes be seen between the two layers - this is usually not oil, but is caused by the light refracting between the two plies. An exception is the Evans Hydraulic, which does have a thin oil layer between the plies resulting in noticeable bubbles. Ply can also refer to how many layers of wood make up a drum shell. The vibration of the drum shell. Generally, thinner drum shells are more resonant, but this varies with shell ply, construction material, and hardware (e.g. hoops and lugs). A more resonant drum shell will allow you to hear more of the drum shell's sound. A drum will be most resonant when tuned to its fundamental note. A quick way to discover the drum's fundamental note is to hit the side of the drum to hear the pitch of the shell. Tuning your drumheads to this pitch will allow for the most resonance - this is where the drum likes to vibrate the most. The size and depth of a drum shell limits its tuning range - if you're struggling to tune a drum to your desired pitch, you may be fighting against its natural resonance. The drumhead on the underside of your drum. You don't hit this one - it's there to provide more resonance. Compared to the batter head, it is usually tuned to a slightly higher or lower pitch (but can also be tuned to the same pitch). Resonant drumheads are usually single-ply and can be very thin, especially for snare drums. How reactive the drumhead is to lighter hits. Thinner and 1-ply drumheads are the most responsive; you will hear ghost notes and light touches better with these heads. Tuning your drumhead tighter will also make it more responsive. This is an important factor to consider, especially with snare drums. If you have a less responsive batter snare head (e.g. one that is thick, heavily dampened, or tuned very low), you can tighten the resonant snare head to improve the snare wire response, which will increase the sensitivity. The screw that tightens the hoop onto the drumhead. This is what you tighten with your drum key. Drums with more rods (and lugs) allow for more focused tuning (less variance in overtones), because they tighten the drumhead more evenly around the shell to produce a more even tone. How long a drum rings out after you hit it. More sustain = longer & louder fundamental notes and overtones when you hit the drum. If you don't like your sustain, think about whether your problem is with the overtones, the fundamental note, or the length of the sustain. If you have a problem with overtones, try tuning each lug more evenly (to the same pitch). Adding dampening (or using drumheads with inbuilt dampening) will also reduce the length of sustain and overtones. 1-ply and thinner drumheads with no dampening will have the most sustain. Sustain & resonance are closely related, and sometimes people use them interchangeably. A synthetic surface designed to replicate animal hide. Synthetic fiber drumheads are designed to replicate the sound and feel of animal hide, which was the most common drumhead material before the 1950s. Compared to regular coated drumheads, synthetic fiber heads are usually warmer sounding. The fiber surface is usually thicker than a regular coating, giving much more focus to the midrange and low frequencies. These drumheads can be played with both sticks and brushes, and look great. The ultimate drumhead search engine. Search, filter, & compare as many drumheads as you like, side-by-side. 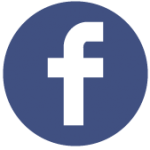 You”l find detailed overviews of Aquarian drumheads, Evans drumheads, and Remo drumheads. Find the best heads for your sound.